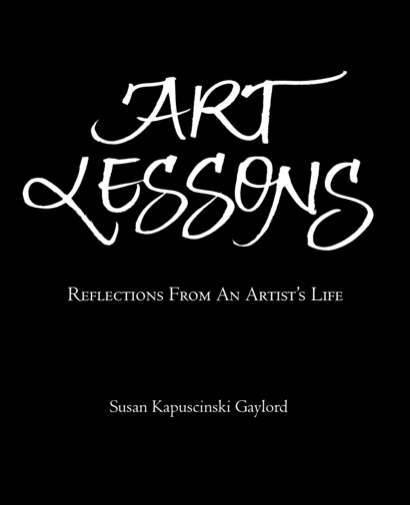 This is the first of three Thoughtful Thursday posts about my latest project, Art Lessons: Reflections From An Artist's Life. It started last fall as a folder on my computer called Advice Book. I had been finding that I was often giving advice—about having a blog, having a facebook, applying for an exhibit opportunity, etc. I was also encouraged by the positive response I have gotten to the reflective posts I have written here and the things I say about choices I have made and my feelings about my work when I give talks. As I started to work, I decided the book would be in two parts. The first would be about the relationship of the artist and her work and the second about getting the work out into the world. As I got deeper into the project, I realized that I was not comfortable with second part. Part of the problem was the tone of authority that I felt was needed to make the book read well. What I am most comfortable with is the way I talk in conversation—lots of "Maybe you could try this…" and "you might want to think about…". What sounds comforting in person is wishy washy on the page. The biggest problem was that talking about getting your work out into the world implies, at least for me, some evaluation of success. My take on that is still conflicted and unresolved. I wanted a book that was open and honest and from the heart and I found that I couldn't write part two with the same conviction I could part one. Art Lessons is about my relationship to my work—what inspires me, what keeps me going. Part personal story and part reflection, the book is seven short essays, each beginning with a hand-lettered quote. I can honestly say that everything I say in the book is something I know to be true for me. It's been a labor of love and a joy to do. I have allowed myself to let it evolve organically and to work from a place of faith—faith that if I respect the process, it will take care of itself. And it has. As a girl, I took after-school art lessons for about a year. I showed no particular promise and remember little except making a color wheel and getting brown instead of purple when I mixed blue and red. I only remember the little red house by the river where the lessons were held because my mother painted a small picture of it that hangs in my studio. It wasn’t until adulthood that I had any thought of making a life in art. 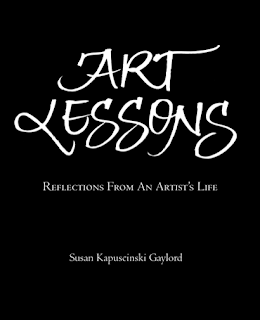 Art Lessons tells some of my story and shares the lessons I have learned along the way. I hope that you may gain some insight from my words and be inspired to spend time with your own story. It is there you can learn from the best of teachers—yourself and your work. Next week's post will be about the form of the book and my decision to produce it Print on Demand through the Harvard Book Store. On the eighteenth, I'll share a chapter and the link to the Harvard Book Store's online bookstore. oh this is good to see Susan will you do a few signed copies?